Sheng Chi Kung Fu teaches Shou Sho Kung Fu an ancient fighting system used for self defense. The online kid’s program touts itself as an anti-bullying tool. My plan was to watch the videos with my son, but unfortunately he lost interest after the first few lectures (short videos). For $27, you will be able to access 15 lectures ranging from 5 to 35 minutes long. The lectures begin with the basics– greetings, bows and tying the belt. A 23-page downloadable handbook is also included. Lectures deepen with stances, locking elbows and demonstrations. 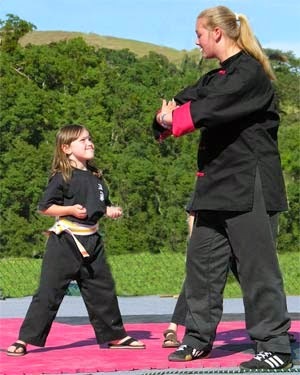 The lectures featured children in a typical martial arts school. Even though I was viewing from home, I felt like I was a student in the class. From my son’s lost interest, I believe this program is better suited for children 8 and up. I think this program would be a wonderful introduction for kids who are interested in martial arts. They can learn a little bit on their own time before committing to a school in their community. I think a DVD version of the lectures might be more engaging then watching on a computer or iPad screen. Maybe even include a belt to use with the tying lecture. Overall, I found the program informative for anyone interested in martial arts. Would you like to try Sheng Chi Kung Fu? You can for 50% off the retail price. Visit the following link to receive your discount Half Off Sheng Chi Kung Fu. Plus you can win a Free 15-Lecture program with a 23-page Handbook. I used to take taekwondo, so I&#39;m hoping to pass on this sport to my boys. I would recommend judo for really small children and as a first martial art. It prepares basic movements and overall fitness.